then look up more online, and then read it again to understand everything. it wasn't long before I found out about Blackest Night, where Barry becomes the Blue Lantern Flash! As USA Weekend says, "The Talk of the Comic Book World"
And it still is 5+years after it's first publishing! the other Corps until I read Blackest Night. Now I want to read more! take a small break after Laughing so Hard! "Life Doesn't Give us Purpose, We Give Life Purpose." 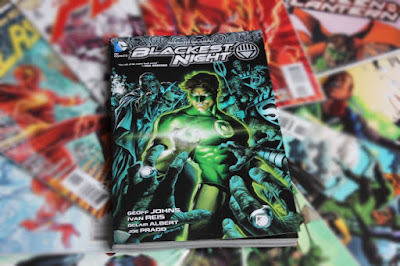 became a Black Lantern, he was just scary! artwork in each panel! I Loved it, I felt it! It was just incredible! But not enough time in the day. The Next read on my List is, you Guessed it! So what was your favorite part about Blackest Night?